If you live in Japan you will have seen 2l plastic bottles filled with water guarding houses, drives and gardens, it was years before I found out what they were for, well I think my husband told me but I didn't believe him! I'm not sure if this method is used anywhere else in the world, the only place I remember seeing them are here, any ideas yet? Well..... they are to scare cats away! Really! 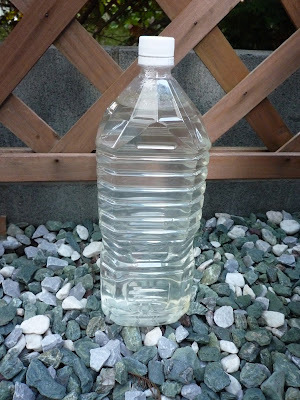 Apparently cats are scared of 2l bottles filled with water, I have no idea whether there is any scientific proof to back this up, I am not even sure why a cat would be scared of the bottle, maybe the reflection but the conditions would have to be 'just right' for that to work. Anyway, we have put some out because the kittens that were born a few months ago have turned into feral beasts and we don't really want them in the yard. Now, if I had more time and money I would set up a 24hr surveillance of the area to see whether the water bottle deterrent actually works but sadly I don't have either so we will just have to wait and see. Do you have any customs like this where you are or any tips for keeping cats out of your yard? I don't think they work ... We use a couple of motion-sensitive devices that emit an ultrasound shriek if anything moves within their beam. It's inaudible to adults, though my kids can hear it, but cats hate it and steer clear. When we moved in the areas round the side and back of the house were basically huge kitty litter trays - now they stay clean! Neighbour's cat was using our sand box as a litter box. No "presents" since we started using the Cat Stop. Runs on batteries, requires no refills of sprays and doesn't require the hose to be turned on 24/7 like the Scarecrow version does so we've been quite happy with it. Funny enough, I've seen this in northern Italy last summer! Ever wondered why people put bottles on there lawns? You may have been told its to keep cats away and its true. But does it work and how? First of all we must half fill a clear plastic bottle with water. ( Its very important to fill half full of water.) Put lid on and place in the middle of the lawn. If you have a big lawn then put a few about. Leave out and see if it works! Cats are suppose to be scared away by the bottle, but how you ask? It works best at night and if there a breeze. Take a light say from a street lamp, car or one of your windows. This light travels through the bottle and the water which is then reflected away like laser beams in different directions giving off little flashes. The cat sees these flashes and Zap! He's away. There you have it so go out and try it out on your lawn. LOL! My cat is not afraid of bottled water! We buy bottled water and put it on the floor sometimes. He could care less about the bottles! He doesn't even notice them. Used to see it all the time when I was a kid here in Australia - not so much in recent years... and never so neatly lol... just empty soft drink bottles with water in them lying on the lawn. Here they were to keep dogs away - not by scaring them, but to stop them from doing their business on the lawn... you see, the theory is that dogs (and I presume cats) won't "go" near a source of fresh water because they don't want to contaminate a drinking source. They can smell the fresh water in the bottles and so they leave that lawn alone and go on the footpath or somewhere else :P No idea if it works, but that explanation always made sense to me. Interesting, I wonder how it all started, I'm not convinced it works! Verypurpleperson LOL - I think that is what vending machines are for!